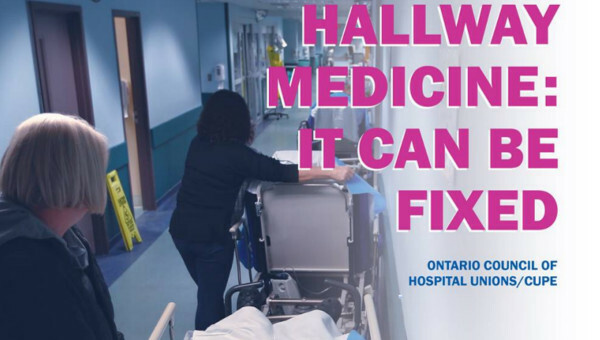 According to healthcare workers interviewed this past year by the Ontario Council of Hospital Unions (OCHU)/Canadian Union of Public Employees (CUPE), the health and wellbeing of the individuals devoted to caring for our health seems to be increasingly at risk from angry, frustrated, or out of control patients. Their experiences are chilling. experienced violence in the previous year. 67% were verbally assaulted. 26% had been subjected to physical assault. 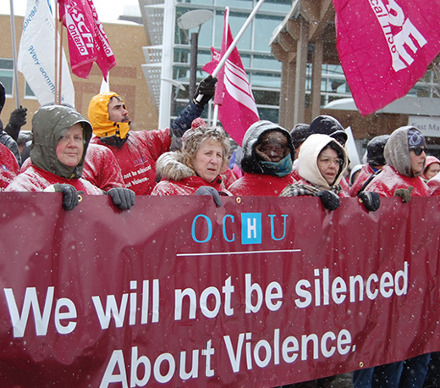 Studies of nurses and personal support workers find disturbing rates of violence. Fewer studies have explored violence experienced by workers in other healthcare occupations – but clearly anyone who is dealing with patients and other members of the public are at risk. Recently, several nurses in Ontario suffered serious injuries from patient attacks. In one case the nurses were repeatedly punched in the head, with one losing consciousness after being thrown against a wall. In another, a nurse was beaten unconscious with a lead pipe. or as unavoidable. Violence in healthcare, in all its forms and degrees of severity, is seen somehow as intrinsic to the job. Violence in healthcare is not just a Canadian problem. According to recent study carried out in the United States, “Health care workplace violence is an underreported, ubiquitous, and persistent problem that has been tolerated and largely ignored.”1 Healthcare workers were found to require time off work due to violence four times more often than other types of injury. The study also identified that the most frequent victims were nurses and nursing aides. Patient caregivers in emergency departments, psychiatric units, and dementia units were found to be particularly at risk. 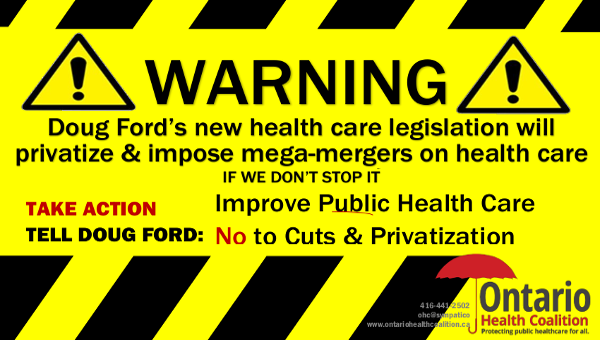 When it comes to protection of healthcare workers, Canadian jurisdictions have nothing to be proud of. A study of violence in long-term care facilities found that Canadian healthcare workers experience six times more incidents of physical violence than their counterparts in Scandinavian countries. 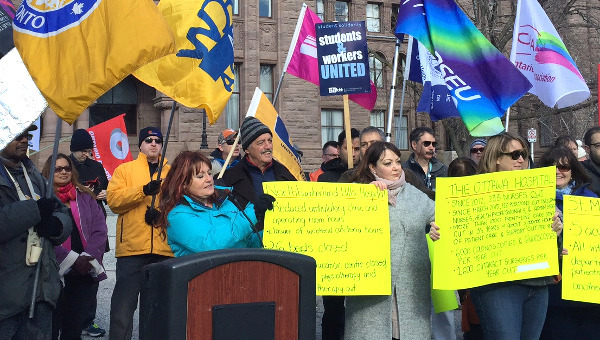 The authors of the study said Canadian workers were experiencing “structural violence,” which they blame on “systemic and organizational factors” such as poor working conditions and lack of adequate support. Harassment – any behaviour that demeans, embarrasses, humiliates, annoys, alarms or verbally abuses a person and that is known or would be expected to be unwelcome. This includes words, gestures, intimidation, bullying, or other inappropriate activities. healthcare workers go unreported. Underreporting is partly a result of the long-standing culture of acceptance and partly because the victims – the healthcare workers – fear retribution from their employers or even the patients. Understaffing has increased frustration among patients and their families rendering healthcare workers more vulnerable to attack. Healthcare workers report that sick workers are not replaced and they often work short of the required number of personnel. doctor with whom she had had a previous relationship. She had reported to her employer that she was afraid of him but was largely ignored. This tragic case resulted in demands for improvement to Ontario’s Occupational Health and Safety Act (OSHA). The act now requires that employers carry out assessments for violence, at least once per year, and that they prepare and maintain policies and programs for preventing violence and harassment. protection of the worker.” Unfortunately, this clause is open to interpretation and does not directly address the issue of violence. Furthermore, healthcare workers have only a very limited right to refuse work they deem to be unsafe. Under Canada’s Criminal Code, Section 270, assaulting a police officer could result in a penalty ranging from 6 month to five years in prison and a $5,000 fine. There is no equivalent penalty for assaulting a healthcare worker on the job! These protections under the health and safety act are not enough. Most attacks on healthcare workers should be seen for what they really are – criminal acts. include any healthcare personnel providing direct patient care. Many states have enacted similar laws. The issue of whether or not the mental competency of the perpetrator of violence precludes criminal intent is decided by the justice system. At the root of the violence problem is the notion in the medical industry that healthcare workers are fundamentally not as valuable as the people that they care for – that they are in service. Gender and social class render them less deserving. That is not to say that workplace violence is limited to attacks on women. Healthcare workers of all genders can be, and have been, victims of violence in all it forms and degrees, indicating a general disregard for the safety of an entire segment of the population. But the predominantly female composition of the workforce is a credible explanation for the fact that violence is routinely experienced by this group without any of the responses that are routine for assaults on other first responders. As we know from comparative studies of other countries, strategies can be employed to reduce or eliminate the threat of violence – within the culture at large and within healthcare. healthcare. It seems, though, that limited healthcare funding has made some employers resistant to spending money on adequate staffing, alarm systems, video monitoring, and security. importing the relevant provisions of the occupational health and safety act into the collective agreement. If you experience violence, REPORT it. Report to your employer and your union all cases of violence or harassment as they are defined under the health and safety act. Make sure your joint health and safety committee is informed. Demand that your employer follow – to the letter and beyond – all of the requirements introduced under recent legislative changes. Demand such safeguards as personal monitors, alarms, adequate and consistent identification of potentially violent patients. Demand adequate staffing to deal with the workload and particular demands of the job. Staffing might include trained security personnel where needed who have with the power to intervene. You should never be alone with someone who has been identified as posing a risk unless adequate safeguards have been implemented. Share your stories of violence with your union and let them share your stories with the public, with administrators, and with regulators. The broader community needs to know what is happening. Demand that acts of violence against healthcare workers be considered criminal. And demand “whistle-blower” protection for workers with the courage to speak out about this shameful state of affairs. 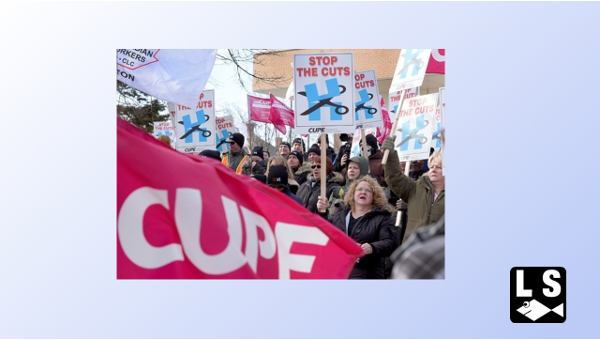 This article is adapted from a fact sheet produced by the Ontario Council of Hospital Unions (OCHU)/Canadian Union of Public Employees (CUPE) and an article to be published in a book on Gender, Health and Work in 2017 by the European Trade Union Institute. James T. Brophy is a PhD student (University of Stirling). Margaret M. Keith is a PhD student (University of Stirling).